Our 2010 Fall project will be to repair and paint the trim, deck, and stairs of the front entryway to the RainyDayMagazine office. We have been putting off the project because nobody wanted to do all of the work (sanding, scraping, etc…) needed to prep the exterior. To get the interns excited (or just out of their chairs), we decided to entice them with a tried and true motivator…labor-saving power tools! At the end of Spring, we made a quick mention of these oscillating tools. We are new to the multi-tool category. Apparently, this is true for quite a few readers as well. 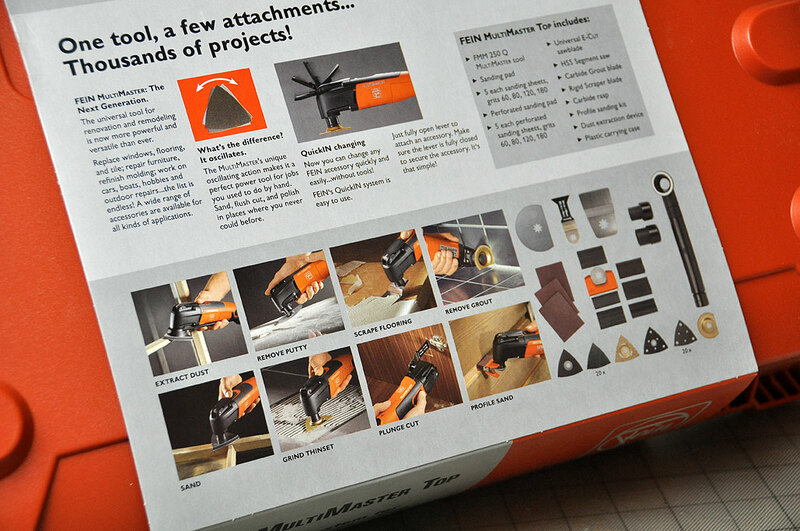 Judging by the emails, many were eager to learn more about the Fein MultiMaster. There are a few different configurations to the MultiMaster line. The tool is the same. The only difference is the number of accessories included with the MultiMaster. The package we have is the TOP. This has most of the often used accessories, with the exception of some the more exotic sanding discs and cutting blades. If you want the MultiMaster for a specific job, then it is probably best to get the START package and add as you go. The custom case is nice to have, but any portable toolbox would work just as well. 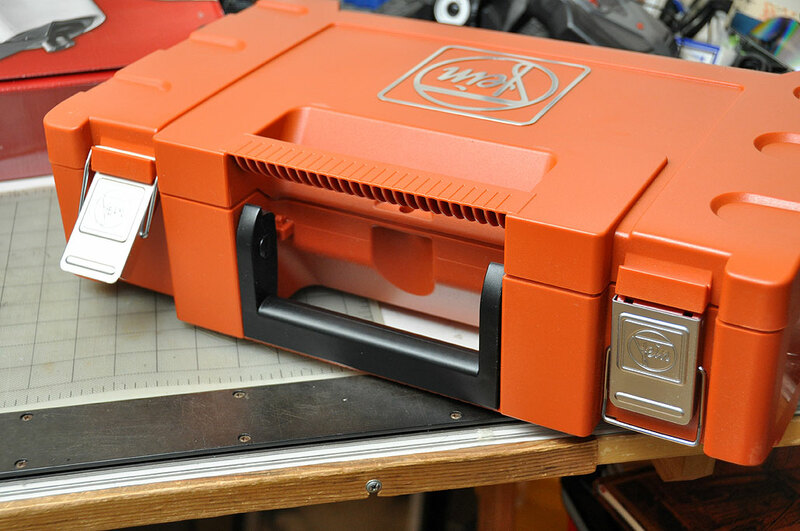 NOTE: In June, FEIN modified the accessory offering of both the Top and Select. These new kits are designated with the new name Top Plus and Select Plus. Check the FEIN site for the most up-to-date configurations. Most of the questions we got asked were about the quality of the tool: will it last? will it stand up to heavy-duty use? etc… Judging by our first impressions, this thing is built like a tank. It fits comfortably in the hand and weighs in at around 3lbs…it has heft. The controls are within easy reach. Nothing feels cheap, loose, or plastic-y. The head (black end) of the tool is made from a block of aluminum and looks very well constructed. The tool came with a nice set of attachments and sanding pads. Note the straight edge on the two disks. One is a cutting disk and the other is a grout removal disk. The straight edge is so the tool can be placed right up to a surface which should not be cut, yet still be able to something at right angle to it. That is a pretty cool capability! We don’t know how to do that with any other tool. The principle behind the Fein MultiMaster oscillating tool is very straightforward. There is an anchor point at the front of the tool that moves left and right. The speed of that movement (oscillation) can be varied to suit the task. 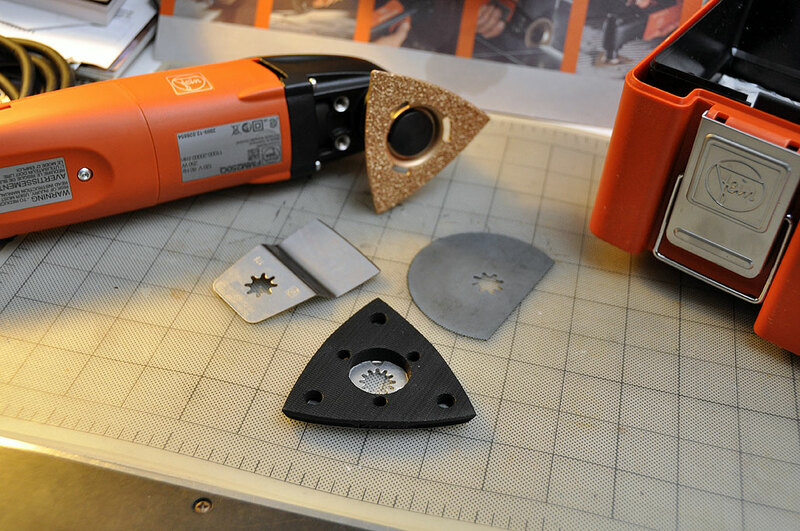 Various attachments and accessories give the tool its versatility (cut, scrape, sand, grind). Since the tool just vibrates, it is easier to control than one which spins. It can get into tighter places, does not over cut, and is more precise. As the tool’s purpose is to be able to perform multiple functions, changing from one to another should be as easy as possible. The MultiMaster has a lever-locking QuickIn mechanism which makes switching accessories a snap…literally. There is no need for a separate key or the use of any tools. Just lift the lever, remove the pin, swap out/in the accessory, insert the pin, lock it down, and you are good to go!